University of Illinois Springfield Chancellor Susan J. Koch helped kick off the 2016-17 academic year by hosting her annual Welcome Week picnic on August 23, 2016. 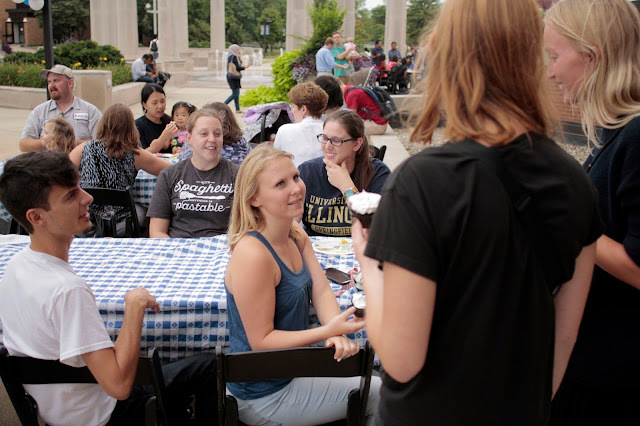 “The Chancellor’s Picnic is a chance for students, faculty and staff to come together and have some social time together and look ahead to the new academic year,” said Koch. Students have an opportunity to meet Chancellor Koch and make new friends at the picnic. “It’s fun because you get to see a lot of people you don’t usually see for the rest of the school year,” said Donae Gordon, a communication major. International student Karan Rikke, from India, came to the picnic for similar reasons. “You get to know a lot of people here, otherwise you end up staying in your community with your own friends,” he said. This year, students were also given the chance to sign a steel beam that will be used in the construction of the new UIS Student Union. “I wish the beam could be exposed, unfortunately that won’t be the case, but all of us who have signed it are going to know that our names are going to be in that student union forever,” said Koch. It’s estimated that more than 700 people attended this year’s picnic.